The high pressure ridge that has been over the west coast is weakening. Today and Tuesday Northern California will be partly sunny and smoky with increasing clouds late Tuesday. Temperatures will be a few degrees above normal. Southerly winds will increase Tuesday afternoon. 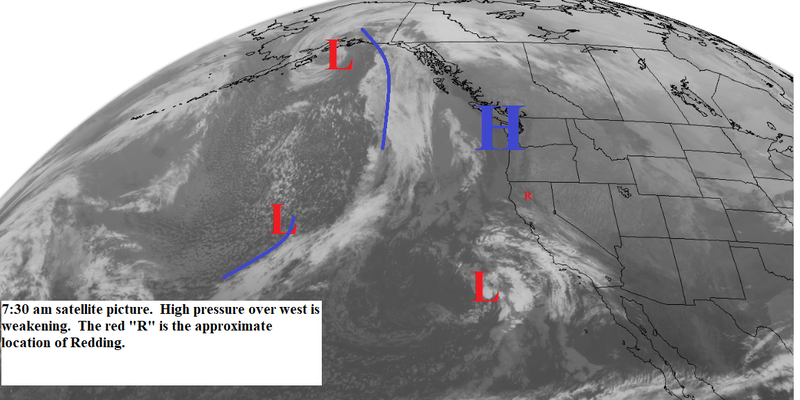 Wednesday through Saturday a low pressure trough will be along the west coast (see map below). This will send several storm system across the north state. Rain will spread over the area Wednesday turning to showers Wednesday night. Snow levels will start out high but drop to 4000 to 5000 feet by Wednesday afternoon. This system will bring moderate precipitation to the area along with gusty south to southwest winds. Thursday morning there will be scattered showers. The next storm system will move through Thursday afternoon and Friday with moderate to locally heavy rain. Snow levels will rise to above 6000 feet. Gusty south winds are expected. Saturday we will have partly cloudy to cloudy skies with scattered showers. Snow levels will be around 5000 feet. Sunday and Monday look partly cloudy to partly sunny. It looks like more storms could move through the mid part of next week.